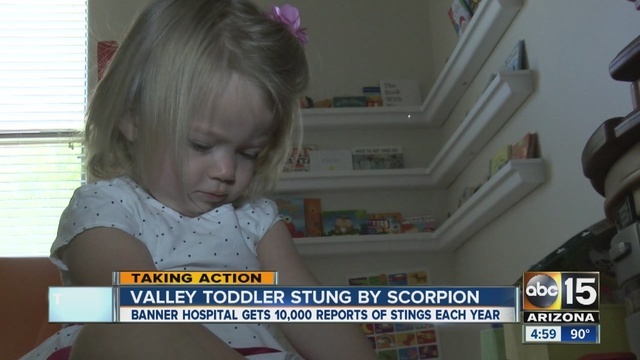 What Happens When Babies or Toddlers Get Stung By A Scorpion? Living in Arizona, it comes as no shock to most of us when we see a scorpion. Many of us have either been stung or know someone close to us who has been stung. We hear of the standard symptoms: extreme burning pain at the site of the sting, increase in pain throughout the body for the next 6 or so hours, followed by numbness in the surrounding area lasting anywhere from days to weeks after the sting. But symptoms and reactions to scorpion stings present themselves much differently in babies & toddlers, even young children. In fact, there is now an anti-venom offered to young children who experience adverse reactions to scorpion stings. Watch the video below to know what to look for. In the event that your child suffers a scorpion sting and starts to vomit and/or shows signs that they are struggling to breathe or have a seizure. Please do not drive them to the hospital, instead, CALL 9-1-1 IMMEDIATELY!! Do not hesitate! It is better to be safe than sorry! To learn more about what to do if your child gets stung by a scorpion and/or stops breathing for any reason, please click HERE to register for one of our CPR & First Aid classes TODAY! !